A very quick and satisfying knit. I’ve made it twice before for gifts in smaller sizes but it still knit up very fast. Less than a week for me of evening knitting, which is very good going! I have to say how surprised I am at how little yarn was used for this (just under 4 balls for the largest size). 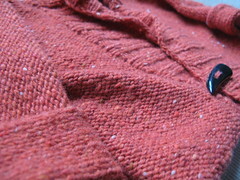 The pattern states 6 balls of Cashmerino Aran which is the same meterage as the Donegal Tweed. I am someone who knits to gauge and consider myself to be a firm knitter, so why this is so out, I’m not sure. If you fancy doing it this way, simply reverse it once you get to the sewing up stage. 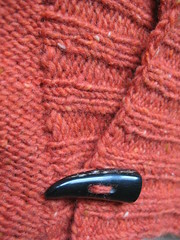 A crocheted loop was added to the RHS of the ribbing to catch the horn button and one on the inside as well for balance. I did include a buttonhole on the RHS about 4 rows from the end but it didn’t look right but the way the shawl collar works, you don’t notice it. So, it’s there if she wants to put a flower in it or something to that effect! The arms come out quite long but I love how they look turned up. If you’ve got a tall babe I’d add an inch or two to the length. I remember my aunt commenting on the Donegal Tweed needing softening up when she last used it. The jacket certainly needed a strong blocking and pressing, so it got the conditioner treatment when I washed it and what a difference it made. What a shame it’s been discontinued. A lovely garment to brighten up our wet, wintry weather.